Yasmin is so loving that she "adopted" ten rescue puppies recently arrived at the shelter and keeps them company while they sunbathe outdoors. Yasmin has three legs and heart of gold. Her story is heartbreaking but Yasmin is so happy now, that a typical rescue video would be too little for her, so we decided to tell her strory in a different way.Yasmin was found living in the streets of northern Greece suffering for months. She had probably been hit by a car. 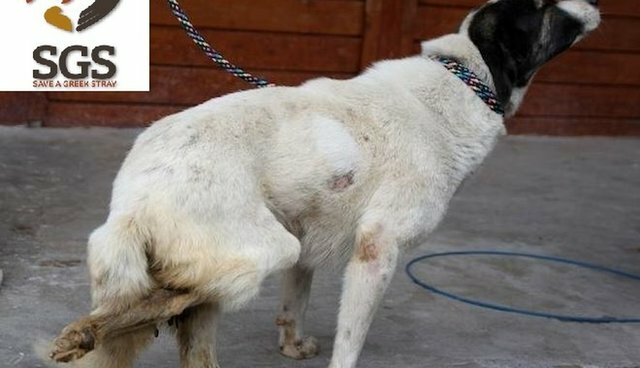 As a result, both her legs and spine suffered severe damages and for a while she even had to walk using only her two front legs. After being rescued by Save a Greek Stray, Yasmin had her right back leg amputated and her left leg started functioning better. Today she lives at the shelter of Save a Greek Stray. She is an amazing, loving dog, so human centered that she'll follow you around wherever you go. Adopting her means having a loyal loving friend for the rest of your life. To adopt Yasmin please contact Save a Greek Stray. Yasmin's rescue video is no ordinary, because she is no ordinary dog. Watch her tell her life story while singing all happy and adorable.